Power Tools UK Reviews » Nail Gun Reviews in the UK: Which Nail Gun is the best? Nail Gun Reviews in the UK: Which Nail Gun is the best? If you have just found yourself on this page then we are guessing that you are most likely looking for a nail gun and you are probably a little confused with all the different types and choices out there. Well, here at DIY-high, we are going to try to break it down for you and lay down side-by-side as many different popular nail guns as we can so that the picture becomes just that little bit clearer. Then after reading our more detailed nail gun reviews further down the page, we hope that you will be in a better position to pick the best nail gun for the job. Both Brad and Finishing nail guns are designed for and best suited to ‘2nd fix‘ home construction work, which refers to the work done internally within a new home build after the wall plastering has been finished. These jobs include architrave and skirting board attachments, beading installation, panelling, and the like. Of course, these nail guns are used for other types of light construction work as well, for example, in furniture-building. Finishing nail guns can be seen as the bigger brother to Brad nail guns using larger 16-gauge nails on jobs that require more robust construction. The Framing nail gun on the other hand is designed for 1st fix home construction work which refers to the work done when actually building the ‘frame’ of the home itself. This means heavier duty work than the 2nd fix jobs that Brad and Finishing nail guns do, as the structure of the building itself uses larger wood stock which needs to be held together more securely. As a consequence, Framing nailers tend to be big and bulky affairs that shoot larger, more substantial nails. Compressed Air powered – Here, the nail is forced into the workpiece using compressed air from a separate air compressor. If you already have an air compressor which can generate sufficient air pressure (and air flow) to operate the nailer in question, then an air powered nail gun is most likely the best option for you, as these air nailers have fewer internal working parts, making them lighter and cheaper than their electrically-powered counterparts. Mains Electricity-powered – With this power system, the nail gun is connected to the mains socket via a standard electrical cord and uses an electrically-driven mechanism to generate the forces needed to fire the nail into the workpiece. If you don’t have an air compressor, then buying a mains electricity-operated nail gun is most likely to be the next least expensive option. In addition, nailers powered off the mains will also tend to be less expensive than the equivalent battery-operated nailers. 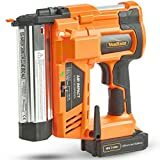 Battery powered without a fuel cell – Once again, like its mains-powered counterparts, battery powered nail guns use various non-consumable electrically-driven mechanisms such as in-gun air compression or flywheel technology to create the forces needed to fire the nail. A major advantage of battery powered nail guns is that they are completely cordless. Battery powered with a gas fuel cell – Here, the nail gun uses the electricity stored in a rechargeable battery to ignite a gas fuel from a replaceable gas canister. The compressed gas is used to generate what is essentially a mini-explosion which exerts the forces necessary to drive the nail home, not unlike the internal combustion engine of a car. The compressed gas fuel is slowly consumed with each nail strike requiring gas cylinder replacement at regular intervals. Once again, these nail guns have the advantage of being cordless. Brad nail guns, as the name suggests, fire 18-gauge brad nails, which are generally useful for lighter types of building work. For example, putting up architrave around windows and doors or installing decorative beading on furniture. Here, in this section of our nail gun review, we have focused solely on the ‘true’ brad nail guns, NOT the nailer-stapler combination-type of nail guns that are sometimes also capable of firing 18-gauge brad nails. Makita is one of the biggest names in power tools, so it is no surprise that they have produced an air nail gun that is well-designed, robust and accurate. The key features of the Makita AF505 (and AF505N) include the location of an air exhaust on the rear of the nail gun that can be directed away from the operator. It also has a tool-less depth adjustment under the trigger that controls how deep to drive the nails, and a tool-less nail jam-clearing mechanism which makes sorting out any malfunction a breeze. Unlike most other nailers, it also has a spring-loaded magazine that makes refilling the nail gun just that little bit more efficient. Overall owners are usually very happy with the Makita AF505-type nail gun. Makita itself is a Japanese company which is renowned for making highly accurate and high quality power tools for both the professional tradesman and the expert DIY-er. Consequently, one tends to pay a higher price for the privilege of owning one of their tools, however owners rarely regret their decision to pay more for a higher quality power tool. Note: AF505 vs AF505N: Makita has discontinued the AF505 (although you can still buy it from various retailers), and replaced it with the newer version, the AF505N. The differences between the two variations are minor, so for the most part, you can consider the AF505 and the AF505N as essentially the same brad nail gun. The one notable difference between the AF505 and the AF505N is in the nose which has been redesigned in the AF505N to be narrower allowing operators to use the nail gun in a slightly more space-restricted area than was possible with the bigger-nosed AF505. The Tacwise DGN50V Brad Air Nailer is the bigger brother of the C1832V reviewed above with the only meaningful difference in the length of nails the two devices can accommodate. The C1832V can hold nails from 10 to 32mm in length while the DGN50V can fire nails that are between 20 and 50mm in length. Once again the tool is fast, lightweight and reliable. Like more expensive counterparts, the handle is a soft silicone-type of material, while the main body of this second fix nail gun has a high-quality finish to it. As with other more pricey nail guns, the DGN50V has two modes of operation, first there is single-fire mode where the safety tip of the nail gun needs to be depressed against the workpiece before the trigger is pulled and a nail is ejected, and a second mode where the trigger is pulled and held, while the nail gun is fired with each depression of the tip against the workpiece facilitating the rapid firing of nails. Another notable feature is the rotatable exhaust similar to the Makita AF505 model that can direct exhaust air away from hitting the operator. Overall, like its smaller sibling, the DGN50V is another worthy, value-for-money nail gun and probably one of the best 2nd fix Brad nail guns in this price category in the UK. The Silverline Brad air nailer 868544 is one of the cheapest Brad nailer guns on the market today. 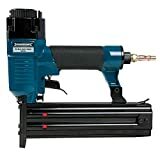 It is powered by compressed air requiring a pressure of between 60 and 100 psi from an external air compressor and takes 100 straight 18 gauge nails between 10 and 50 mm in length. It weighs 1.5 kilograms making it one of the heaviest compressed air powered Brad nail guns available. It comes with a 1/4” quick connect that needs to be screwed into the body of the nail gun when first purchased using PTFE tape to ensure a tight seal. The 1/4 inch quick connect also requires the less-common Euro-style coupler on the air compressor’s air line for a successful mating. As with more expensive Brad air nailers, the Silverline 868544 also features bump firing when the trigger button is continuously depressed. As for build quality and design, the Silverline 868544 air nailer is a little rough around the edges compared to more expensive competitor nail guns, with its less than ergonomic edges and some ‘fiddly-ness’ when installing nails into the magazine. In addition, the nose assembly on the Silverline nailer lacks any form of cushioning, such as a rubber tip covering, and consequently it tends to leave small depressions where nails are inserted especially in softwood. When it comes to function, the Silverline 868544 air nailer exceeds expectations for such a low priced tool and does not jam very often especially when it is looked after properly. Users have found that the regular application of oil to the nailer is essential to minimise nail jamming. In fact, owners recommend applying oil to the nailer before each use and even during use if it is used over an extended period of time. Fortunately, the nailer comes with a small bottle of air tool oil, so new owners will have everything at hand right from the outset. It is also recommended that high-quality nails be used to minimise jamming as cheaper, less well-packed nails are more likely to exceed the tolerance of the Silverline nailer leading to more misfirings. If you are unlucky enough to have a nail jam then clearing it on the Silverline nailer requires using the included Hex Keys to remove several screws and is thus a lot more tedious than on more expensive nailers which can often be cleared without the need for tools. Overall the Silverline Brad air nailer 868544 is great value for money especially for hobby work and for the odd DIY job around the house as it will do the job with minimal fuss and at minimal expense. However, the Brad nailer is not really a tool for the professional tradesmen as it requires a little bit too much care and attention for it to continue to work smoothly, and it is not really built to withstand the harsh environments that builders and tradesmen often find themselves working within. The air nailer SA791 is one of Sealey’s answers to the 18-gauge Brad air nailer category. It is a relatively low-cost lightweight air nailer with a good design that is well-balanced and easy to handle. The handgrip on the SA791 is reasonably comfortable and with the air nailer’s average weight of 1.3 kg, it can be used all day if necessary without too much tiring out of the hands or arms. Notable features on the Sealey SA791 are an exhaust outlet at the back of the air tool that can be rotated so that the puff of air expelled from the air gun with each firing can be directed away from the operator, while the magazine loading mechanism is a satisfyingly smooth affair when it comes time to reload the air nailer with more nails. The SA791 nail gun takes straight 18-gauge Brad nails, 15 to 50 mm in length, and the air nailer even comes with a starter set of Brad nails so that you can get going right from the outset. To top it all off, the whole air nailer package comes with its own case which is always a well-received accessory for any power tool and indispensable when the tool needs to be stored or transported. In action, the Sealey SA791 rarely jams, especially if care is taken at the start of each work day to add a few drops of the airline oil that comes with it, to the tool’s air inlet (assuming that the air compressor system itself does not already have an integrated oiler as part of the setup). As for the air compressor needed to power the Sealey SA791, it has to be able to reach an outlet pressure of 60 to 100 psi which most compressors designed for the workshop can achieve. Although Sealey does not provide information on the minimum free air delivery (cfm) requirements of the SA791, the air nailer can be operated successfully from even the smaller 24L workshop air compressors that are commonly available without any issues with air flow. One point to note is that the Sealey SA791 is strikingly similar in construction to the Silverline 868544 (reviewed above). Clearly, both Silverline and Sealey make use of the same manufacturer for this air tool, which most likely uses many of the same components for both air nailers but with different colour schemes and branding on them. Overall, the Sealey SA791 (much like the Silverline 868544) is a reasonable Brad air nailer that is sufficiently well designed and easy on the budget. As expected from one of the big name air tool brands, Bostitch, the BT1855-E is a solid, well balanced, light and quiet air nail gun that has been thoughtfully designed for the trade professional. Although its features are typical of most brands of nail gun, these premium power tools tend to sport higher quality components while a lot of thought has gone into the design of every detail of the machine. The handle consists of a rubber-type of material giving it a strong and comfortable grip, while the air exhaust has been located at the bottom of the handle to angle the exhaust gas away from the user. It also has a depth adjustment that allows exquisitely fine adjustment of how deep the nails are driven into the workpiece. The belt clip can be installed on either side of the body of this second fix nail gun to accommodate both lefties as well as right-handers, and it even sports a pencil sharpener and a hex key holder. Probably the only negative is the low availability of Bostitch-brand nails for it to use. Fortunately, using the more readily-available Tacwise nails with this Bostitch nail gun also works a treat. Overall, the Bostitch BT1855-E is a fine piece of kit to have at one’s disposal, and although it is more costly than other brands available on the market, it may well be worth it if it is going to be used extensively. When it comes to the best brad nail guns that are mains electricity-powered, taking into account quality and value for money, there really is only one brand that stands out above the rest, Tacwise. 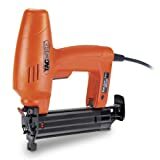 The Tacwise range in this category consists of three models that pretty much cover the full range of requirements users might be looking for in a brad nailer. The Tacwise 181ELS, the model 1183, and the Tacwise 400ELS are each designed specifically for a different range of nail types. The 181ELS holds straight 18 gauge brads between 15 -35mm long, while the model 1183 takes 20 – 50mm long straight brad nails. As for the 400ELS, which has an angled magazine to allow it access to more space-limited areas, it takes type 500-series 18 gauge angled brad nails. All three Tacwise corded nail guns perform admirably and possess most of the features that more expensive professional tools are kitted out with. They are well made – much better than some other equivalently-priced electric nail guns that are available in the UK. It is highly recommended to use Tacwise nails with Tacwise nail guns as this ensures the least chance of nail gun jams, and since the Tacwise nails are reasonably-priced, it would seem to be a no-brainer! Of course, for the price one is paying, the Tacwise nailers are not going to be completely up to the same standard and robustness of more expensive premium tools. The mains-powered Tacwise nailer suffers from a couple of niggling issues that potential buyers should be aware of. First off, owners have found that the Tacwise corded nailer that uses mains electricity as its power source does not always fully drive the nail into the workpiece. This, however, may be partly due to using the nail gun sub-optimally rather than solely due to an inherent deficiency within the tool. Specifically, owners have found that the no-mar tip on the nozzle of the device which is used to protect soft wood from bruising can inhibit nail penetration in hard woods, and it appears that removing this soft tip solves the problem when using the corded nail gun on tougher materials. 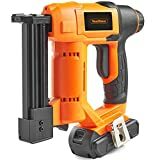 The second minor issue with the Tacwise corded nail gun is with its electrical cord length which is shorter than expected, and which is surprising given that this is a tool that is often used in just about every corner of a room. The electrical cord is under 2 metres in length which often makes it too short to use without an extension cord. This is especially true in rooms with few electrical outlets or when areas of a room above shoulder-height need to be worked on. Overall, however, the Tacwise 181ELS, Tacwise 1183, and Tacwise 400ELS nail guns, in our opinion, are some of the best electric nail guns that you can get in the UK when taking into account both overall functionality and price. In the battery powered nail gun category, there is usually a choice between choosing a nail gun that uses consumable gas fuel and nail guns that don’t. These gas fuel cells can rapidly raise the working cost of the machine especially if the nail gun is used a lot. Therefore, in general, we at DIY-high prefer the nail guns that don’t require the extra running cost and if we can avoid it, we usually do, even if it means going for a higher-priced machine. That is why for 18-gauge brad nail guns that are battery powered, there really is currently only one contender for the top spot, and that’s the Ryobi R18N18G-0. The Ryobi R18N18G-0 battery-operated nail gun, together with its bigger 16-gauge sibling reviewed below, are in a class of their own with their unique Airstrike technology, which does away with the need for expensive gas fuel cylinders. Ryobi has achieved this by incorporating air compression right within the tool itself, so in effect it is not dissimilar to using a compressed air powered nail gun only without the air compressor and without the hose line, but with all the power of an air powered tool. Having the air compression within the nail gun itself does make the tool much bigger and less wieldy than some of its gas fuel-fed counterparts, but that’s the price one pays for not having to constantly buy fuel cells for the nail gun to operate. Overall, the Ryobi R18N18G-0 is well-designed and robustly built and is best suited for the expert DIY-er or tradesman as it can be quite an expensive machine. Finishing nail guns are not dissimilar to Brad nail guns, but typically fire 16-gauge nails as opposed to the 18-gauge ones used in Brad nailers. This makes for a significantly stronger fixing, so finishing nail guns tend to be used for slightly heavier building work like affixing skirting board to walls, or building the larger components of furniture. This does not mean that they can not be used for some finer work if the operator is experienced and sufficiently skilled. Once again the Tacwise brand of nail guns is prominent at the top of a nail gun category, this time the Tacwise GFN64V is one of the best air powered 16-gauge finishing nail guns we’ve found, based on a combination of decent quality and design combined with a decent price that has made this air nail gun popular amongst consumers. It has all the features we have come to expect from a high quality nail gun and is robustly built so should be at home even on a busy work site. As with other full-featured nail guns, the GFN64V can be made to fire single nails or multiple nails in rapid succession while their depth can be varied accordingly using a dial. Nails are loaded into the back of the magazine without the need for opening it in an action that is not unlike loading a rifle, which has a certain military-style pleasure to it! The exhaust is located on the back of the machine, and can be rotated 360 degrees so as not to point at the user. The GFN64V also features a tool-less jam-clearing mechanism over the nose of the nail gun. One important point to remember as with all Tacwise nail guns, is to use Tacwise-branded nails with this nail gun as it has been reported that the GFN64V can jam on an irritatingly-regular basis if other non-Tacwise brand nails are used. The story might be getting a bit old but it is hard to deny that once again Tacwise has produced a nail gun favourite in yet another category, this time in the 16-gauge mains-powered finish nail gun grouping, with its model 1187 finishing nail gun. The Tacwise 1187 is powerful enough to penetrate all types of wood although it does require a bit of experience to ensure the nail drives home fully into some harder woods. In the case of hardwoods, using the model 1187 requires both hands, one to pull the trigger and the other to apply sufficient pressure to the back of the nail gun to reduce the recoil so that the nail full penetrates the workpiece. The technique does require a bit of practice but its not too difficult to master. One potential way to get around this limitation is to remove the rubber footing on the tip of the nail gun. This has helped with nail penetration with other mains-powered Tacwise nail gun models and may also help when using the Tacwise 1187. However, due the size and weight of this nail gun model, removing the soft tip often leads to denting of the surface of the workpiece when the nail gun is fired, and this is exacerbated by not applying sufficient force on the nail gun to reduce the recoil. As a result, using the nail gun without the soft tip is not recommended on jobs where a pristine surface finish is required. One other point to note with this mains-operated nail gun is that it does requires a lot of current to operate, so it is preferable to ensure that you run it on at least a 30A household circuit to prevent any chance of tripping a circuit breaker (regular household sockets in the UK are usually on a 30A ring main, so for most people this should not pose a problem). 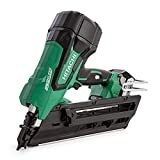 In this category of battery powered finish nail guns, there are a number of good nail guns to choose from as they are dominated by the big brand names in power tools, Ryobi, DeWalt, Makita and Hitachi. The Ryobi and the DeWalt nail guns are our personal favourites, since they do not require the use of gas fuel cells to operate, meaning one less consumable is needed and so running costs will be lower. However, one needs to remember that since everything is incorporated within the nail guns themselves, they are much heavier than the gas powered nail gun competitors from Makita and Hitachi, and will tire out the muscles much more readily with extended use. First up is the Ryobi One+ R18N16G-0 Finish nail gun with its Airstrike technology. Essentially, the R18N16G-0 is the bigger sibling of the previously discussed Ryobi 18-gauge brad nail gun, where ‘Airstrike’ technology means that air compression is integrated right into the nail gun itself, obviating the need for consumable gas fuel cells that are typical of most battery-operated nail guns. However, because it has more working parts to accommodate this air compression mechanism, the Ryobi 16-gauge nail gun is quite big and bulky, although it is nicely weighted and is slightly lighter then the fuel-less DeWalt Finish nail gun competitor discussed next. One other nice feature of both the Ryobi R18N16G-0 nail gun and its smaller sibling is that they are part of Ryobi’s One+ system, where the same battery system is used in a large range of different tools. This means that if you already own or plan to own other Ryobi One+ tools, then the battery packs are all completely interchangeable across the range of tools. Unsurprisingly given its pedigree, the Ryobi R18N16G-0 feels well made and robust, so will likely last a long time, an important factor considering it is not cheap! Overall, the Ryobi R18N16G-0 is currently one of the best 2nd fix Finish nail guns available and our top choice in this nail gun category. Next we have DeWalt’s contender in this battery-operated 16-gauge finishing nail gun category. Like the Ryobi nail gun, the DeWalt DC618KB also does not require gas fuel canisters to operate, instead relying on a flywheel mechanism to generate the forces needed to shoot the nail. Unlike many other brands of nail gun, DeWalt has got the technical specifications on this nail gun just right so that it leaves no inadvertent marks on the workpiece surface apart from the nail hole itself. This is part of the reason most experienced users of the nail gun cannot contain their enthusiasm for this nailer. You also do not have to use DeWalt-branded nails with the DC618KB – users have reported that more-economical Tacwise nails also work well with this DeWalt nailer. Although the DeWalt nail gun is a superb nailer all-round, it is unfortunately let down by its use of Nickel-Metal Hydride (Ni-MH) batteries as opposed to Lithium-ion (Li-ion) ones, and for this reason alone, the Ryobi nail gun discussed above trumps this DeWalt in our opinion. Makita, another one of the premium power tool producers, has created an excellent all-round battery-operated gas powered nail gun, the GF600SE. The GF600SE is a nail gun for the trade professional and has a price to match. As one might expect from a professional machine, it is powerful and is quite loud compared to other competitors. Unlike the Ryobi and the DeWalt competitor nail guns discussed previously, the Makita GF600SE does require gas canisters to supply the fuel needed to drive the nails into the workpiece, something we at DIY-High dislike since it raises the daily running cost of the machine. Overall, as one might expect from Makita, precision and design are second to none, and we think that the GF600SE is an excellent finishing nail gun if you can afford the high price tag and the higher running costs. Hitachi is another big player in the power tools market and is well known for making high quality premium tools for the trade professional and expert DIY-er. For the battery-operated gas powered nail gun category, it has produced a straight-nail nail gun, the NT65GS, and an angled-nail sibling, the NT65GB, that are both excellent nailers. Like the Makita GF600SE, the Hitachi NT65GS and NT65GB both rely on ignition of gas fuel from small consumable canisters to produce the forces needed to drive the nail home. Unfortunately, once again this raises the running costs for the operator on nail guns that are already quite pricey to begin with. However, if you don’t mind the higher running costs, then you will most likely be very pleased with the performance of the Hitachi nailers. Framing nail guns are used for heavy duty 1st fix nailing such as in building frame work, flooring, fencing and decking. They are essentially larger and heavier versions of the Brad and Finishing nail guns, and they dispense larger nails. Like 2nd fix nailers, different 1st fix nail guns are designed to be powered by one of a number of different types of power system. The framing nail gun model no. 282400 from Silverline is one of the few inexpensive options available for anyone looking to get their hands on a framing nailer. It shoots 50 to 90mm long clipped head nails that are 10 – 12 gauge in thickness using compressed air from an air compressor that should be able to produce pressures of between 75 and 115 psi. This is within the range of what most home workshop air compressors can achieve, although the (arguably more important) air flow metric for the nailer is not provided by the manufacturer, making it difficult to say exactly which air compressors will work well with this nail gun. The connection to the nail gun is via a standard 1/4 inch BSP push-fit air inlet common to hoses on most consumer air compressors. Other notable features on the Silverline framing nail gun are the ability to adjust nail penetration depth, a no-mark tip that protects the surface of the workpiece from the impact of the nailer, and a cut-out safety feature that prevents firing of the nail gun when the magazine is empty. Being an inexpensive nailer, however, the Silverline 282400 is more designed for the DIY user and not for the building professional as the framing nailer is not built to withstand the heavy use that is typical of building sites. For example, the nailer requires more daily upkeep than more expensive brand name tools, not something that can always be relied upon on most work sites. In particular, it is recommended to add a tablespoon of air tool oil to the air inlet of the nailer on a daily basis or before each use in order to keep the nailer jam-free. If a nail jam does occur on the Silverline 282400, rectifying it is not a tool-free affair, requiring the supplied hex keys as well as a spanner or two to get to the heart of the nail dispensing mechanism – not something you want to be doing on a regular basis in a professional setting. Finally don’t expect this Silverline nail gun to last indefinitely especially if used excessively, as spare parts and servicing for the power tool are essentially non-existent which means that it will need to be replaced when things do eventually go wrong with it. Overall, the Silverline 282400 framing nailer is a tool for the occasional DIY-er who does not want to spend a lot on a tool that is to be used infrequently but still wants power-tool convenience when the need arises for the nailing of larger wood stock together.